spectrum_viewer.sb2 - This is a simple program that uses the LimeSDR-Mini to receive radio signals in the 2.4GHz band and then plots them using the two types of spectrum viewer (spectrum and waterfall). loopback_test.sb2 - This is a loopback program similar to the loopback implementation given in the programming guide. This variant also includes all the radio components required to generate and demodulate an OOK radio signal. tx_example.sb2 - This is a complete OOK radio transmitter that operates in the 433MHz band. It repeatedly transmits ‘Hello World’ messages for a limited period of time. rx_example.sb2 - This is a complete OOK radio receiver that operates in the 433MHz band. It receives inbound messages for a limited period of time, displaying the received messages in the Scratch Cat’s speech bubble. 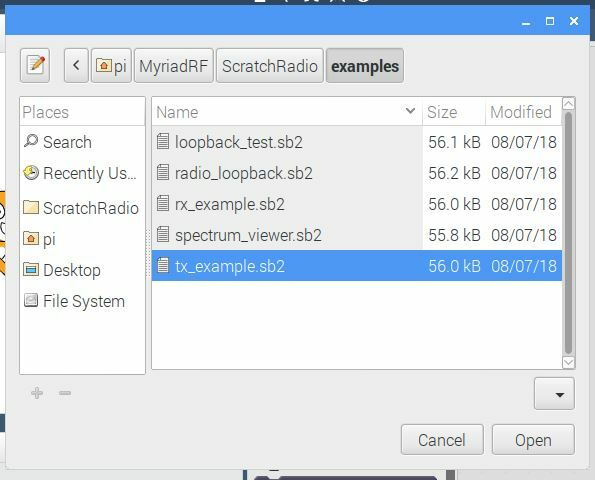 radio_loopback.sb2 - This combines the transmit and receive examples in a single program, so that a single Raspberry Pi can be used to demonstrate messages being sent and received. Note that there is currently an issue with restarting simultaneous transmit and receive operations , so repeatedly running this example will not always be successful. This should be less of an issue with real applications which are not expected to repeatedly stop and start the radio.